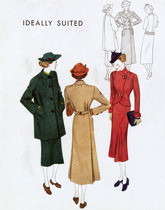 A loose green coat, straight at the front, makes one type of jacket for a Spring suit. A smart double-breasted reefer coat has a fitted waistline and two pleats in back. A corset-cut, fitted jacket of reddish wool with a slim skit flared in an unusual way.